Quality smallmouth habitat is critical at all stages of a smallmouth's life. Though somewhat adaptable,it is not nearly as flexible in its habitat toleration as is the largemouth bass. Specific conditions must be present for smallmouth to thrive. As this photo shows, the presence of chunk rock, gravel and pebble rock of dissimilar size is the bottom surface upon which smallmouth habitat is based and where smallmouth are most at home. Additionally, quick access to deep water close by is also an attraction. Generally, smallmouth habitat is considered to be lakes and rivers with cool, clear, deep water and rocky or boulder strewn bottoms. Smallmouth are, in fact, rarely found in bodies of water less than 25 feet deep. They prefer water with a current and temperatures between 67° to 71°F. They like habitat with ample opportunity to spawn and abundant food sources, especially crawfish. In large highland and canyon-land reservoirs this type habitat is often found concentrated in specific limited areas which attract concentrations of smallmouth bass. In rivers and streams some smallmouth often have more "wander lust", moving up or downstream several miles while others "stay closer to home". However, since smallmouth are almost never the dominant species in a lake they must at times take whatever habitat is available after largemouth and walleye have staked their claims. For smallmouth bass occupying habitat sometimes becomes a matter of having no other choice, rather than one of preference. Though smallmouth bass prefer a water temperature of 67° to 71°F they can often be found in warmer water in the summer months. This is due to the likelihood that in summer months deeper water in lakes and southern reservoirs will lack sufficient oxygen. In Tennessee, in the summer, it isn't unusual to find them in water that is in the high 70°'s to low 80°'s in impoundments like Dale Hollow and Center Hill. What about cold water? It has always been widely accepted that smallmouth bass in rivers and streams become lethargic as the water temperature drops to below 50°F and almost cease to feed at temperature below 40°F while occupying the deepest parts of pools. However, some studies of smallmouth in Wisconsin showed that they remained active and feeding in water only ten feet deep even when the water was near freezing. Smallmouth can't tolerate low oxygen levels like largemouth. They must have at least a 2.0 ppm for survival. To be feed actively and to maximize growth a level of 5 ppm is necessary. In summer months smallmouth may find it necessary to move from the deeper water they prefer to shallow water because there is insufficient oxygen in the deeper water. This is especially true in highly fertile bodies of water. In infertile waters, which are best for smallmouth habitat, there is usually found sufficient oxygen in whatever water smallmouth venture. Water collects oxygen from exposure to the air and as a byproduct of photosynthesis by aquatic plants. All lakes have sufficient oxygen levels in "shallow water" due to the water circulation caused by wind and the fact that shallow water is where the aquatic plants grow. Moving water, where you often find smallmouth bass, is continuously mixing with the air so almost never experiences low oxygen levels. Aquatic plants also contribute greatly to the dissolved oxygen of rivers. In fertile lakes, where organic matter is abundant, oxygen is rapidly consumed, often faster than it can be replaced. Stratification occurs as plants and animals die and sink to the bottom where they decompose. This process of decomposition greatly reduces available oxygen forcing fish into more shallow areas. Low fertility lakes (oligotrophic) have deep clear water with ample oxygen even in its deepest areas, are weedless, heavily rock bound and most often located in the colder region of the Canadian Sheild. These lakes are not good largemouth bass waters though they make good smallmouth habitat and great trout waters. Mesotrophic and eutrophic lakes, both more fertile than ologotrophic lakes, are better largemouth bass habitats. 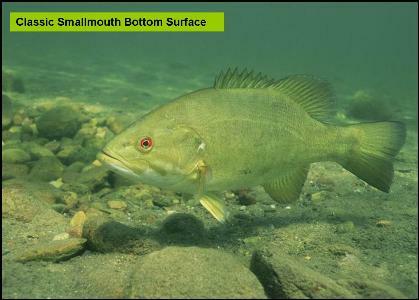 The bottom substrate is quite important for smallmouth habitat. They will usually congregate over a bottom that is covered with rocks of dissimilar size. Gravel, small rocks and softball and basketball size rocks are the greatest draw. In these rocks are where a smallmouth finds its favorite foods, crayfish, insect larvae and invertebrates. Giant boulders and slab rock are secondary attractors. In lakes where the entire floor is rocky, as found in aged southern reservoirs or shallow northern lakes, smallmouth will sometimes move to sandy, weedy areas where there are found more baitfish. A gravel bottom also provides great spawning substrate for smallmouth as well. The geological shape of a lake or river bottom is its structure. This includes submerged islands, drop-offs, flats, the all important points and any change in depth, be it a foot or twenty feet. Smallmouth bass relate to structure as reference points guiding daily activities and for defining their "home" territory. 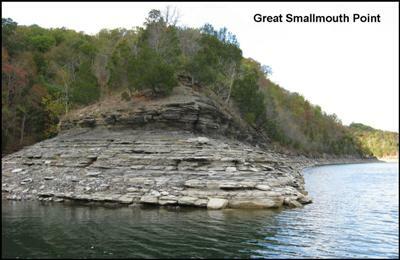 Structure, as does cover, contributes to the making of good smallmouth bass habitat. Cover is anything that is upon the natural lake "structure". This includes lily pads, grass, logs, brush, docks, tires, sunken Christmas trees, flooded timber or buildings to name a few. Smallmouth tend to spend more time around rocks than the type cover a largemouth will hang around. Understanding what constitutes good smallmouth habitat and the relationship between "structure" and smallmouth bass location is critical if you are to become successful in finding the elusive bronzeback.